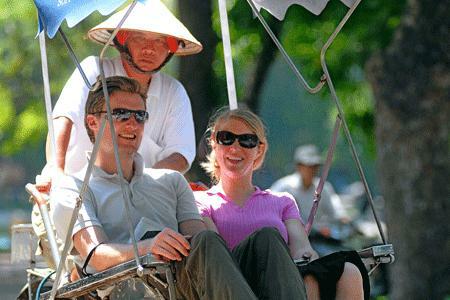 A street vendor tries to force a foreign tourist to buy sourvenir in Ha Noi. The city authorities are considering setting up a tourism police force to protect tourists from being overcharged and harrashed by street vendors. Cases are reported daily of foreign tourists being overcharged by taxi drivers and cheated by hotel employees. This has negatively affected the image of both the city and the country in the eyes of international visitors, said the department’s deputy director Mai Tien Dung. Colonel Dao Duy Ngoc, deputy director of the city’s police department, agreed with the proposal for the creation of a tourism police force. “This is a good idea. We will set up the force as soon as it is approved by a higher authority”. Such issues arouse partly due to the lack of authorities’ sufficient management in tourism. Major-General Le Van Cuong, former director of the Institute of Strategy and Science under the Ministry of Public Service, said that the force alone would not solve all the problems. “The tourism industry should firstly analyse its strength and weakness. Only then will it know if co-operation from other authorities is necessary,” he said. “Another important measure is to raise people’s awareness so that tourist businesses are fully conscious of the risks that their customers face and potential scammers know that their behaviour is unacceptable,” he pointed out. “However, if the police are needed whenever a problem occurs, then we will definitely set up a specific police force in the future,” he added.